Take your fedora hat collection up a notch in style by wearing Steven Land fedora hats. Steven Land has created a collection of stylish fedora hats that just reflects style and shows people that you know how to wear a stylish fedora. 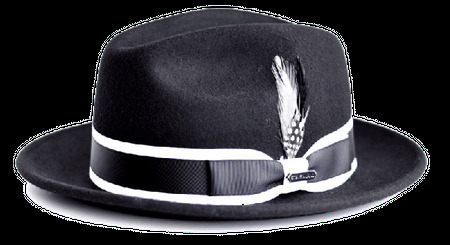 This black and white fedora features a contrasting black and white hat band with bow artfully sewn on and the hat is made of rich Australian wool felt that feels pretty much like fine cashmere.